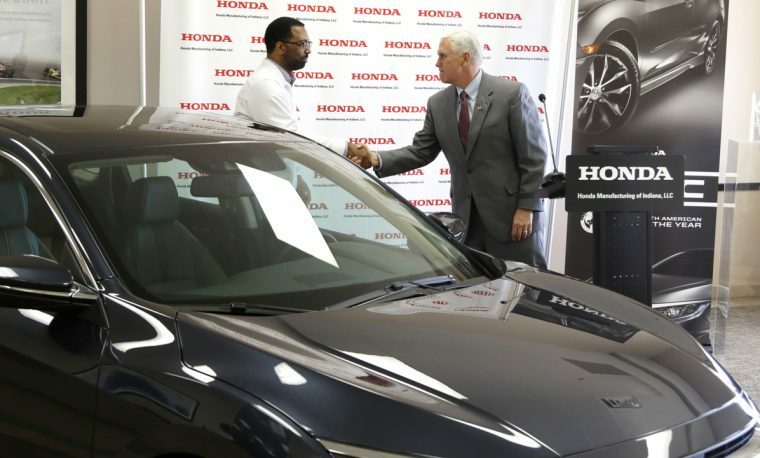 Fred Payne (left), business division manager at Honda Manufacturing of Indiana, greets Indiana Governor Mike Pence at a news conference today announcing a million investment at the Greensburg plant. Honda announced today that the company is investing $52 million into its Greensburg, Indiana facility and creating 100 new jobs at the plant, in order to support early-2017 production of the CR-V.
Honda Manufacturing of Indiana (HMIN) announced back in January that it would begin production of the Honda CR-V beginning next year. 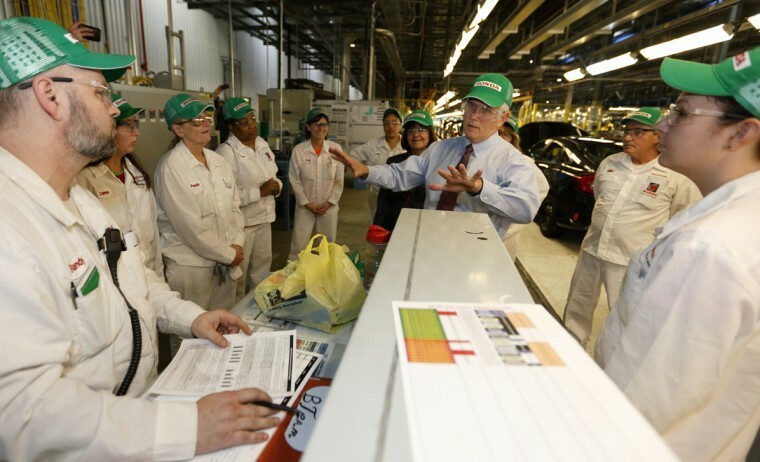 HMIN will continue to produce the Honda Civic Sedan, meaning the plant will be responsible for producing America’s best retail-selling compact car and the country’s best-selling SUV. Indiana Governor Mike Pence was present for the big announcement, and to tour the Greensburg facility, as well. Honda also took advantage of the opportunity today to showcase its new Associate Resource Center (ARC), a career development facility meant to promote the advancement of HMIN associates’ manufacturing skills. According to Honda, ARC represents the company’s commitment to workforce development in North America. “Our Honda associates are our foundation and this new training facility will provide them with the opportunity to continue to grow and develop their skills,” Nelson said.